Toyota Kirloskar Motor (TKM) started making and selling cars in India a little less than two decades back, and it's been a mixed innings for this highly respected Japanese manufacturer. They have done extremely well with their SUVs and MUVs with many Indians swearing by the Toyota Innova, Fortuner and even the now discontinued Qualis, with which Toyota began its Indian journey. 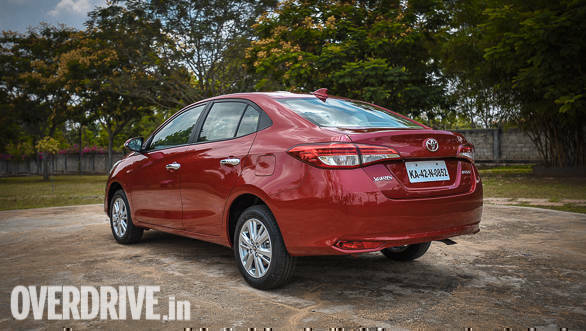 But when it comes to hatchbacks (Etios Liva) or compact sedans (Etios), or even executive (Corolla) and premium (Camry) sedans, Toyota have still not scored big. But now they appear very keen to change this with the introduction of the Yaris. Can the Yaris be a winner for Toyota? 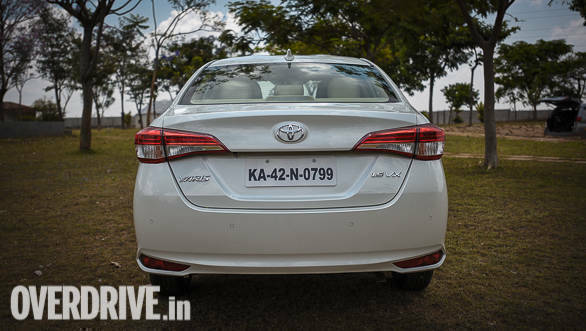 Toyota has taken its time in entering the highly competitive mid-size sedan segment that is dominated by the likes of the Hyundai Verna, Honda City, Maruti Suzuki Ciaz, Volkswagen Vento, etc. 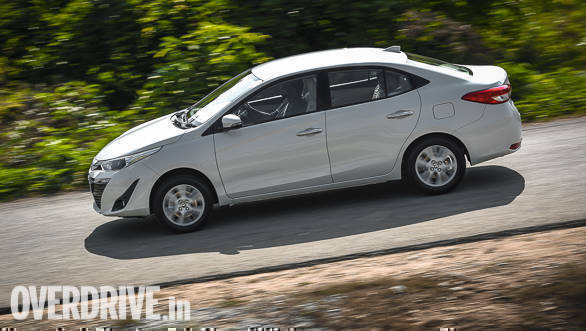 Nevertheless, Toyota appear to have prepared well for this battle with the Yaris being packed with features, including some seen for the first time in this segment. The Toyota Yaris is equipped with features like all-wheel disc brakes; 7 SRS airbags; roof-mounted rear AC vents with ambient lighting; tyre pressure monitoring system (TPMS); electrically adjustable driver's seat; 7 -speed automatic CVT (Constantly Variable Transmission) with paddle shifters; hill start assist and vehicle stability control; acoustic and vibration control glass; projector headlamps with LED DRLs, etc. 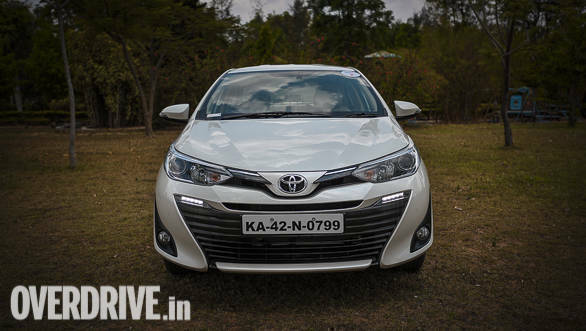 The Toyota Yaris is well-proportioned with some nicely designed elements like the long and slim headlamps and slender front grille, with the equally thin LED DRLs placed on both sides. In contrast are the massive air vents in the bumper. 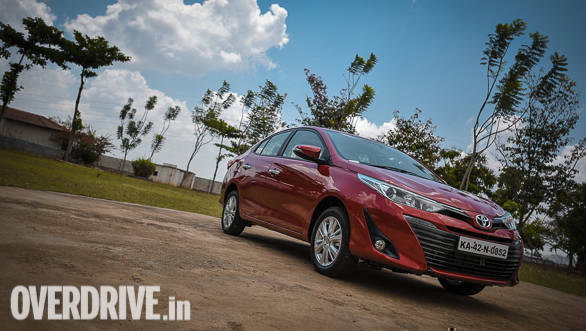 However, the Yaris like several other Toyotas is rather conservatively styled and does not have the flamboyance or eye-catching looks that many Indian consumers are known to like. Given this, it remains to be seen how well it is accepted by people once it starts rolling out of showrooms. Dimensionally, at 4425mm, the Toyota Yaris's length is less than the Hyundai Verna (4440mm), Honda City (4440mm) and Maruti Ciaz( 4490mm). 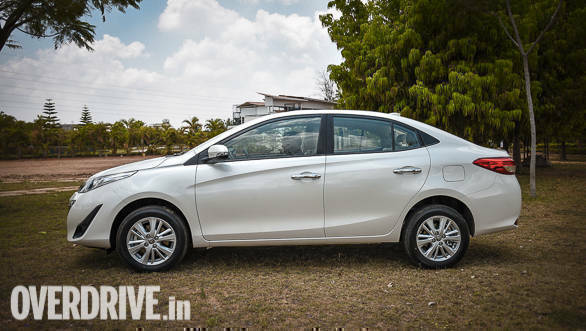 In height also, the Yaris (1475mm) is shorter than the Verna (1485mm), City (1495 mm) and Ciaz (1485mm). But in width (1730mm), it's wider than the City (1695mm) and almost the same as the Verna (1729mm), while being identical to the Ciaz (1730mm). 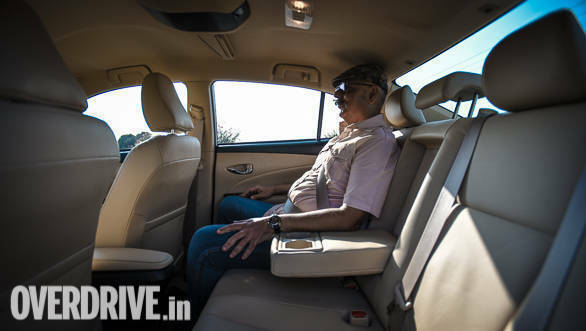 As a result, three persons can sit abreast at the rear in fair comfort and Toyota has also installed an adjustable rear centre head restraint for this. 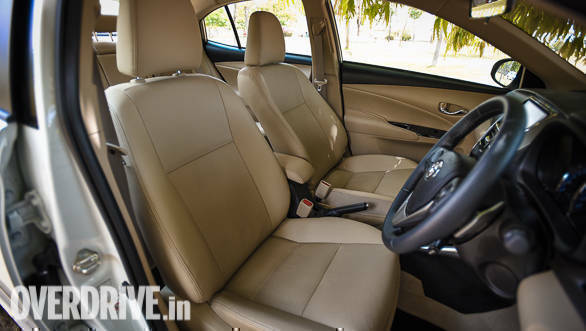 As mentioned, the Toyota Yaris is somewhat smaller in size than its main rivals and while a direct back to back comparison in future will establish if this also translates into less space in the cabin, the initial impression is that the passenger compartment is not as spacious. But to its credit, the Yaris's interior looks bright and inviting and is very sensibly laid out. Everything falls to hand easily and all instruments and dials and switches are effortless to read and operate. The highlight, of course, has to be the roof-mounted AC vents that are extremely good at directing cool air for the rear seat occupants comfort. 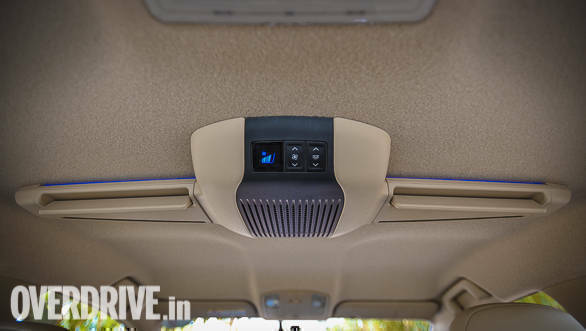 Normally, in vehicles from this or even higher segments, you get a/c vents placed low down in the back of the centre console or on the insides of the B-pillar and these do not cool as effectively as the roof-mounted ones on the Toyota Yaris. Interestingly, these vents also have a substantial swivel, and in case the back seat is not occupied, the air can also be directed onto the front seats, to further enhance cooling. As already stated, the Toyota Yaris is shorter in height than its rivals and this along with the sharply sloping roofline, limits headroom at the rear. The fact that the seat is also placed further back and closer to the rear windscreen only worsens matters and most tall people will find the headroom to be insufficient. 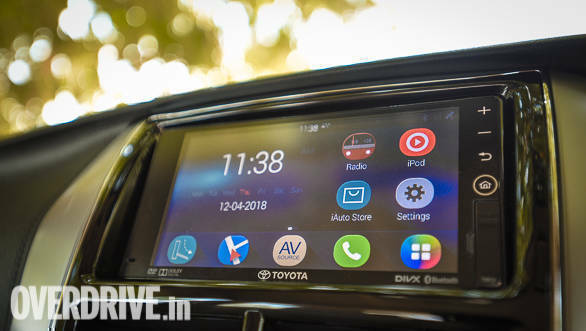 The Toyota Yaris has a nice touchscreen infotainment system with hand gesture controls and though I did not use it much on our first-drive around Bangalore, it does not appear to be lacking in anyway. One feature I think will be particularly useful on our noisy and loud roads are the acoustic and vibration control glass that helps limit the amount of noise that seeps into the cabin. Ironically, while Toyota has attempted to curtail noise from the outside, the a/c blowers (both at the front and back) are quite loud, especially on the higher speed settings. But Toyota needs to be credited for focusing on safety and offering 7 SRS airbags, including driver and passenger airbags, side airbags, curtain shield airbags, as well as knee airbags, which are a first for this segment of vehicles. For now Toyota is only offering the Yaris with a 1.5-litre VVT-i petrol engine generating 107PS and 140 Nm of torque. 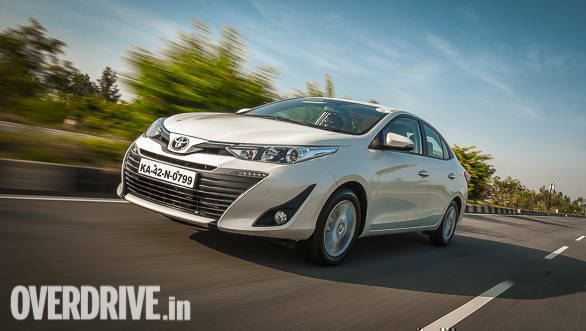 Most of its rivals have the option of both petrol and diesel engines, so the Yaris may lose out because of this. 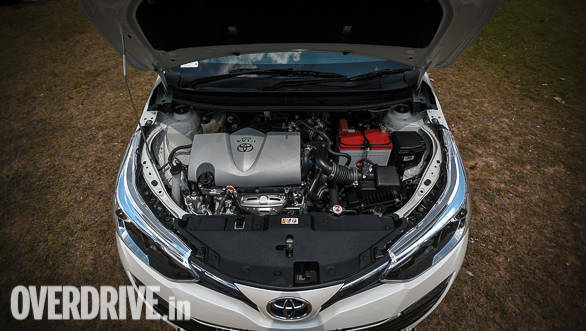 The fact that its petrol unit is less powerful than the ones in the Hyundai Verna (1.6 L and 125 PS) and Honda City (1.5 L and 120PS), will also not aid matters much. The petrol engine in the Toyota Yaris, is not the most rev-happy one around and beyond 4000 rpm it gets quite vocal and intrusive too. For rapid motoring, you have to push the motor really hard and speedy overtaking requires downshifting. In fact you need to work the gears and keep the engine on the boil constantly, if you want some speedy progress. The fact that there is so little power in reserve means you are frequently giving the engine and transmission a proper workout. The Toyota Yaris's 1.5-litre engine comes mated with either a 6-speed manual or a 7-speed CVT transmission with paddle shifters. As is to be expected, the CVT sounds noisy and the rubber band effect of the engine rpm rising without the equal proportion of speed building in the car makes one feel you are not moving forward fast enough. But the shifts are very smooth and jerk free, even while using the paddle shifters. These also add an element of sportiness to the driving and allow one to draw the best out of the engine more effectively. And if you are driving in a relaxed manner, the CVT makes the environment more comfortable by effortlessly shifting in a non-bothersome way. 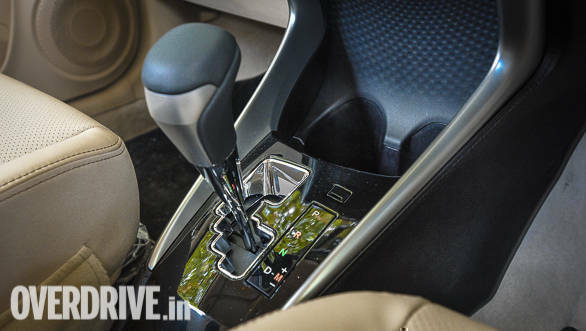 The manual 6- speed gearbox has a very light and precise shifter and the clutch action and effort is also undemanding and driver friendly. As mentioned, the engine needs to be worked to draw out all its performance. Vibrations from the engine are very well damped, but it becomes fairly audible, especially after crossing 4,000 rpm. 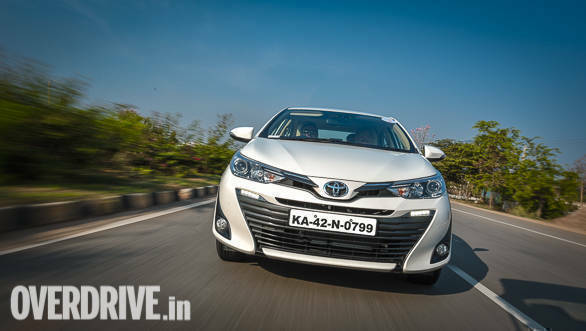 The ride comfort is good with the Toyota Yaris ironing out road deficiencies in an appreciable manner. Broken roads, potholes, speed bumps, etc are all tackled without the Yaris losing its composure. 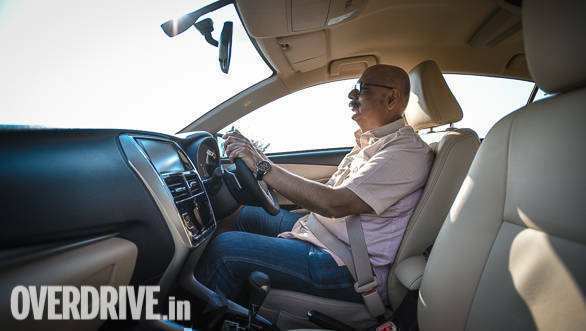 But you have to be a bit careful on larger speed breakers because the ground clearance is 152 mm, compared to the 165 mm of the Hyundai Verna and 170mm of the Maruti Ciaz. The steering feels a little vague and slow to respond and lacks adequate feel. But what enhances the confidence level while driving are the all-wheel disc brakes that help arrest motion and speed in an appreciable manner. The Toyota Yaris also comes with ABS and EBD and stops smartly. The first impression is that the Yaris takes less distance and time to slow down and stop than its rivals, but only a proper test with our measuring equipment will confirm this. 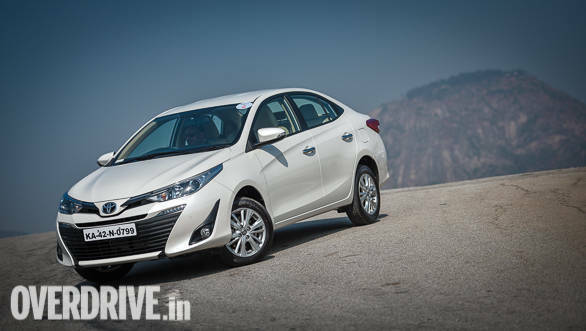 While Toyota is still to announce the price of the Yaris, we expect it to be positioned slightly below the Maruti Ciaz and Honda City and below the pricier Hyundai Verna. 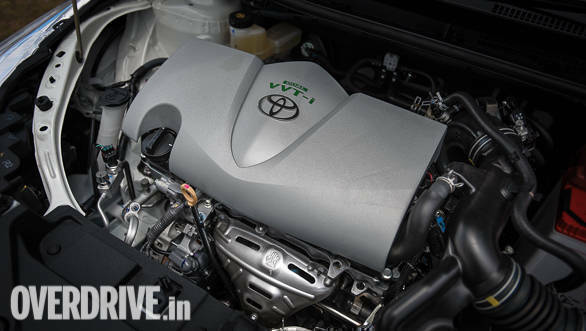 Fuel efficiency as per Toyota is 17.1 kmpl for the manual and 17.8kmpl for the CVT. With its attractively long list of features, inviting pricing, and Toyota's reputation for building reliable and well-engineered products, the Toyota Yaris may just have the ammo it needs to take the battle to its opponents.